“We hope to be back and enjoy more of this fabulous city with our friends at French Links! We are celebrating our 21rst anniversary this year as a private customized tour company, offering private customized tours and VIP services for guests from all over the world. Our motto “Stay Curious, Travel Different” is one that applies to all our tours, whether you are visiting France, or other parts of Europe, including Italy, Belgium, Spain, the United Kingdom and Greece—places where we regularly send our guests, whether they are doing a landed tour or a ship-to-shore visit. As the founder of French Links Tours, I had no idea that when I launched my first website in 1998, that customers from all over the world would land on it, while I slept! That’s the beauty of the internet, and it continues with the relaunch of this site which is now mobile-friendly. But even if you have the best technology in the world, nothing can replace the work that we pride ourselves on doing from our detailed quotes and illustrated itineraries (both in English), the white-glove service from the time you get off the plane and meet our VIP greeter who helps you bypass passport control to the guides who will take you on skip-the-line tours and help you discover the most enriching aspects of European history, culture, food, wine and shopping, to the chauffeur who will assist you at airport check-in or train boarding. In these challenging times, we believe it is important the travel be both life-enhancing and seamless, especially when you have worked so hard to find the time and the budget for that once-in-a-lifetime trip, whether it’s your honeymoon, a graduation present for your children, an institutional donors trip, or a surprise vacation for a loved one. 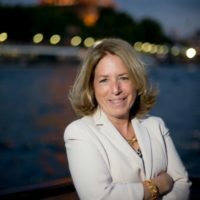 My passion for travel is unabated; it began when I first visited France as a young girl of 12, continued with my writing and publication of the Little-Known Museums In and Around Paris, London, Berlin and Rome, and goes on everyday when I thrill to make new discoveries in Europe and beyond. With our experience and connections, we are often able to make the impossible a reality—whether it’s visiting the private apartments of the kings and queens at Versailles, the towers of Notre Dame Cathedral when they are closed to the public, or seeing Leonardo da Vinci’s Last Supper without any crowds to disturb you. Yes, all that, and more is possible. Some of you may have special needs and mobility issues; we are always available to address these as well with the utmost ease and efficiency. Whether it’s the Louvre or the Eiffel Tower, Westminster Abbey or Windsor Castle, the Acropolis or the Vatican, French Links Tours always finds a way to work around the red tape so you never miss out, regardless of your needs. French Links Tours is much more than a travel planning company—we are truly a labor of love. That is why we have guests come back to us year after year, requesting us to arrange private tours and activities of all kinds—whether it’s cooking class and wine tasting in a luxury rental apartment—or a visit of a champagne house or winery that rarely opens to the public. Whether you do a half-day tour with us or a multi-day travel program, we pride ourselves on bringing the same level of detail and effort so that you never forget your travel experience. French Links Tours also arranges customized trips to other European destinations, such as the United Kingdom, Belgium, Italy, Spain, Switzerland and Greece and we invite you to learn more about these travel experiences by contacting us soon. So do feel free to drop me a line at [email protected] or call me at +336-64-35-87-63. If you are calling from the US you can reach us at +1 415 691 6107. We look forward to making all your travel dreams a reality. As the founder ofFrench Links Tours, I had no idea that when I launched by first website in 1998, that customers from all over the world would land on it, while I slept! That’s the beauty of the internet, and it continues with the relaunch of this site which is now mobile-friendly. In these challenging times, we believe it is important the travel be both life-enhancing and seamless, especially when you have worked so hard to find the time and the budget for that once-in-a-lifetime trip, whether it’s your honeymoon, a graduation present for your children, an institutional donors trip, or a surprise vacation for a loved one. With our experience and connections, we are often able to make the impossible a reality—whether it’s visiting the private apartments of the kings and queens at Versailles, the towers of Notre Dame Cathedral when they are closed to the public, or seeing Leonardo da Vinci’s Last Supper without any crowds to disturb you. Yes, all that, and more is possible. French Links Tours is much more than a travel planning company—we are truly a labor of love. That is why we have guests come back to us year after year, requesting us to arrange private tours and activities of all kinds—whether it’s cooking class and wine tasting in a luxury rental apartment—or a visit of a champagne house or winery that rarely opens to the public. Whether you do a half-day tour with us or a multi-day travel program, we pride ourselves on bringing the same level of detail and effort so that you never forget your travel experience.